You can make more patients happy. Patients will begin enjoyable life after surgery with clear vision and spectacle independence. AcrivaUD Toric has the largest diopter range in the astigmatism correcting IOLs which is defining as Custom Made Perfection. Spherical power starts from 0.00D to 32.00D and cylinder power range is available up to 10.00D with half diopter increments. Larger incision causes itself surgically induced astigmatism and directly effects post-operative refractive outcomes. 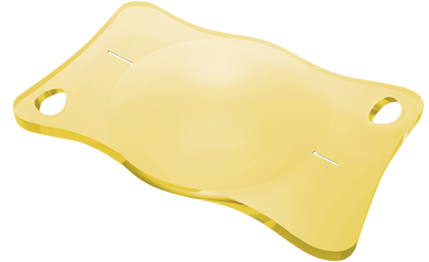 AcrivaUD Toric Plate haptic is the best choice platform enables implantation through sub 2.0 mm incision, it can minimize surgically induced astigmatism and stays in capsular bag without rotation. Successful toric implantation starts with precise examination and evaluation of the amount and axis of corneal astigmatism. Selection of an ideal patient for toric application keratometry, biometry, pupillometry, aberrometry, videokeratoscopy or any other devices are recommended to use as a preoperative diagnostic evolution. Spherical power: 0.00 D to +32.00 D, in 0.50D increments. Cylindrical power: 1.00 to +10.00 D, in 0.50D increments. Special production: -20.00D to 0.0D and from +32.00D to +45.00D in 0.50D increments. 1- Nichamin LD., Astigmatism control. Opthalmol. Clin. North Am. 19, 485–493 (2006). 2- Ferrer-Blasco T. et al. Prevalence of corneal astigmatism before cataract surgery. J Cataract Refract Surg 2009; 35:70-75. 3- Source: Warren Hill Keratometry database, Clinical study of 5987 US patients. 5-Ferreira TB, Marques EF, Rodrigues A, Montes-Mico R. Visual and optical outcomes of a diffractive multifocal toric intraocular lens. J Cataract Refract Surg. 2013;39(7):1029-35. 6- Visser N, Nuijts RM, de Vries NE, Bauer NJ. Visual outcomes and patient satisfaction after cataract surgery with toric multifocal intraocular lens implantation. J Cataract Refract Surg. 2011;37(11):2034-42. 7- Munoz G, Cardoner A, Albarran-Diego C, Ferrer-Blasco T, Belda-Salmeron L. Iris-xated toric phakic intraocular lens for myopic astigmatism. J Cataract Refract Surg. 2012;38(7):1166-75.